Add some nostalgia to your wardrobe this summer with Baby-G's latest additions to the popular BG-169 collection. The two new models, the BG169R-2C (light blue) and BG169R-4E (light pink), include translucent bodies and bands with a matte finish in bright colors. The timepieces reflect a unique neo retro theme, featuring pop colors inspired by the games, music players, and cassettes of the 1990s. The BG169R-2C comes in a translucent blue with orange accents, while the BG169R-4E comes in a translucent pink with red accents. Whenever on the go, the BG-169 models provide a stylish addition to your wardrobe and include functional features to make the most of your summer activities. 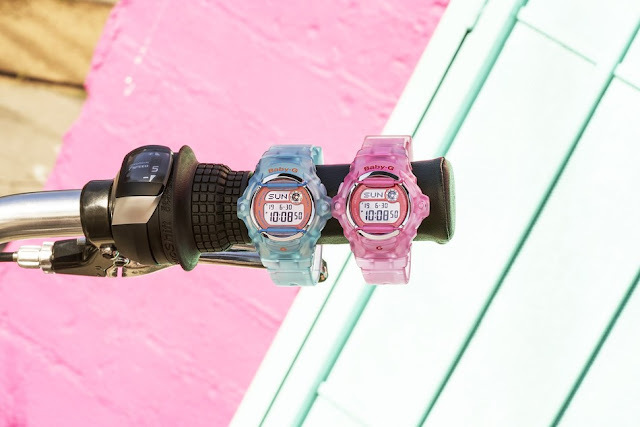 The BG169R-2C and BG169R-4E retail for $79 USD, and are available now for purchase at select jewelers, baby-g.com, and the G-SHOCK Soho store. For more information about the Baby-G brand, visit https://www.baby-g.com/.